Momentum Gives Away a Tesla! Momentum Textiles is proud to announce…“All Momentum fabrics are made with recycled or natural fibers. In celebration of this milestone we decided to give away a Tesla. Tesla Model S is living proof that you do not have to compromise design or performance to achieve new levels of sustainability. Our contest launched in January via our website. We offered an opportunity for an entry to win a Tesla, through a random drawing, for each specification of any of our products. 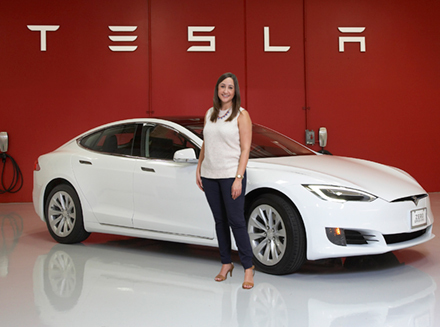 Momentum Textiles is pleased to announce that Megan Schriefer from Cincinnati has won Momentum’s Tesla Model S giveaway. “We are encouraged to see the depth and breadth of sustainable projects taking place in our industry today. We received thousands of entries. The quality and the quantity of entries exceeded our expectations” said Roger Arciniega, CEO. “Many of my customers love the idea of going green but aren't sure where to begin. For a hospital client, choosing Momentum's Silica gives them a product that is not only sustainable but it performs beautifully” said Megan Schriefer. For the last decade, Momentum Textiles has been in the process of transitioning our product offering to be 100% Reduced Environmental Impact. Momentum Textiles is the first company in our industry to accomplish this goal. Industry firsts such as Silica, created to be the most sustainable alternative to vinyl and Naked Nylon™, made from the first new recycled yarn in over 15 years, were instrumental in achieving a new level of Sustainable Performance.